In January 2014, Angela Erickson of Lexington, N.C., contacted Scottsville Museum to tell us that she and her husband had been digging around an old railroad track in the Lexington area. 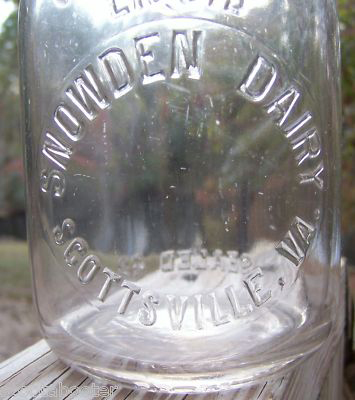 Quite by surprise, they uncovered an old milk bottle, which was slug-plated "Snowden Dairy, Scottsville, VA," as shown in the above photo. Angela said she excitedly began researching Snowden Dairy but had not found additional information about the dairy. So she contacted Scottsville Museum. We were intrigued by her bottle discovery as we, too, did not have information about Snowden Dairy in our files. In an effort to learn more, we contacted two avid Snowden researchers, Joanne Yeck and Richard Nicholas. 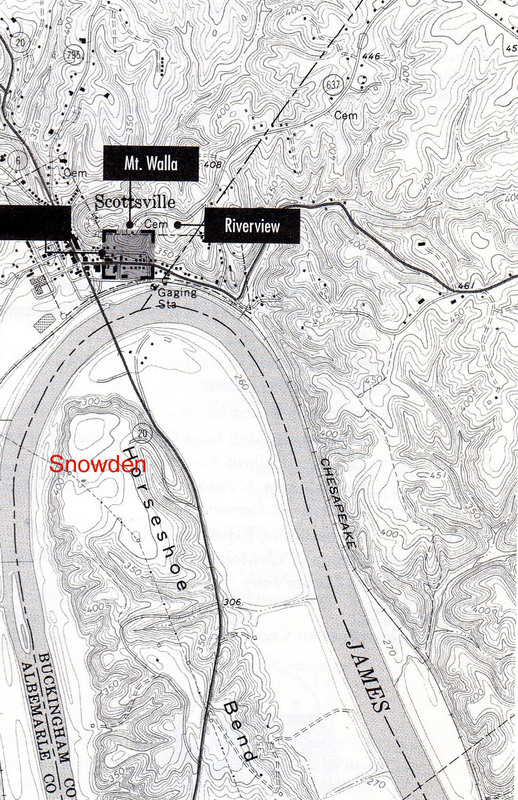 Joanne said that she had been told that a German man bought part of the Snowden lowlands circa the mid-20th century. 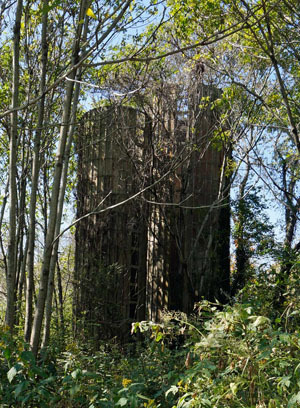 In October 2013, Joanne visited Snowden Farm and uncovered a clue to a possible dairy farm, namely old, vine-covered equipment and structures such as this silo at right which is still sitting on these Snowden lowlands just across the James River from Scottsville. Richard added that the German man's name was Dominik Stillfried and that he was an ex-German soldier who came to Virginia after WWII. Stillfried started working at Snowden for the farm's owners at the time, Richard said, and performed so well in his farmhand role that the owner soon named him farm manager of Snowden. With the name, Dominik Stillfried, we quickly surfaced an autobiography by Dominik's wife, Elko von Krogh Stillfried, entitled Leaves in the Wind: Thirty Years Spanning the Continents, and learned that Dominik came to the U.S. in the winter of 1951. For $100 salary per month, Dominik took a job as a farm laborer on Snowden Farm, which his wife described as a small dairy farm across the river from Scottsville. At that time, Snowden Farm consisted of 600 acres, including woodlands and was run as a dairy with a hundred Guernsey cows. The cows were milked with electrically-powered milkers, and in the early days of the dairy, the Snowden milk was delivered daily to Mr. Jessup's Monticello Dairy in Charlottesville. Most of the cattle feed was produced on the farm with a few machines and stored in a silo and other farm structures. Dominik and Elko next purchased Scottland Farm, a 1025 acre farm west of Scottsville for $578,000. (Note: Scottland Farm was the old Scott place where John Scott (1725-1798) lived; John was the grandfather of John Scott (1796-1829), who was the founder of Scottsville.) Elko described this experience as quite elating: "The transformation of a life of 'hands on' farmers at Snowden to that of managing this much larger project at Scottland was quite elating. We had a regular dairy crew amongst the ten employees, but Dominik's presence and action was required everywhere in the operation....The dairy crew would frequently call Dominik out in the middle of the night for some cow care or even milking if one of them did not show up. It never was an easy job, but we did it and progressed well as 'Virginia Country Gentlemen.'" "Eventually together with a good friend from Germany, we bought back Snowden Farm to run it along with our Scottland Farm, six miles distant. Unfortunately, 3 hurricane-induced floods quite devastated the buildings and lowlands of Snowden Farm and proved that the re-purchase of Snowden had been a miscalculation. It had to be sold again." Special thanks to Joanne Yeck for her Snowden silo photo and Richmond Times-Dispatch images of the Snowden Farm sale advertisements above. Also we thank Richard Nicholas for connecting the Stillfrieds to Snowden Dairy and Scottland Farm and thus firing up our research. Finally, thank you, Angela Erikson for capturing our interest in Snowden Dairy and to Elko Stillfried for her very helpful autobiography that provided details about the Snowden Dairy beginning in 1951. We will continue to research the dates of the Stillfrieds' two purchases and sales of Snowden Farm in deed records and will add that information as it is acquired. And if any of our readers know more about Snowden Dairy, these milk bottles, and the years that the dairy was in existence, don't hesitate to contact us at [email protected]. We'd love to learn more! Stillfried, Elko von Krogh. Leaves in the Wind: Thirty Years Spanning the Continents, New York, NY: Vantage Press, Inc. 2005.